Old Faithful Inn sits magnificently among the towering pines and mountains of Yellowstone National Park. Tourist who stay at the Inn are treated to one of natures most magnificent shows—the eruption of Old Faithful Geyser every 90 minutes spewing a spray of subterranean water over 150 feet into the air. 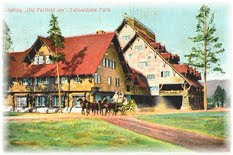 The Northern Pacific Railroad built Old Faithful Inn in 1903 with the thought of enticing well-heeled easterners to travel by train to the West, where they would experience the wonders of nature and the rugged outdoor life that only the West can offer. The establishment of Yellowstone in 1877 by the United States congress was in response to a new awareness among Americans that some areas of our environment needed to be preserved for future generation. And over the last one hundred and thirty-one years, National Parks in every state of the Union have provided Americans and peoples from all over the world, a glimpse at pristine environments that have changed little since first discovered by Native Americans many centuries ago. In order to keep our parks as natural as possible, planners built structures within the parks that blended into the natural environment,which pleased the eastern travelers who could not get enough of the American West. By so doing, architects inadvertently influenced an emerging architectural philosophy that park buildings should reflect regional culture and be constructed out of materials indigenous to the area. This was the beginning of a trend that ultimately became known in the architectural world as Parkitecture. 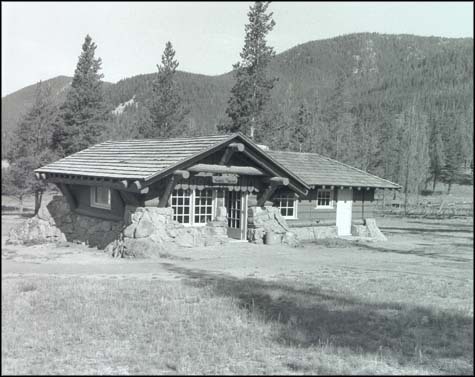 Even though the building resembled a Swiss Chalet, the heavy use of logs and wood shingles reflected the frontier tradition and blended well in the Rocky Mountain environment. Other national parks followed Yellowstone’s lead. 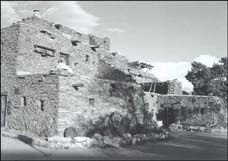 At Grand Canyon National Park in 1905, Fred Harvey Company and the Santa Fe Railroad built Hopi House across from the El Tovar Hotel. 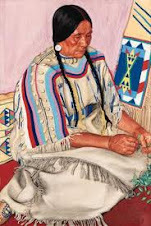 Hopi House acted as a gift shop, where Native Americans sold their wares to tourists. 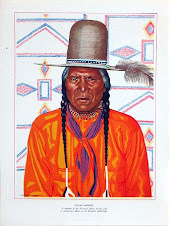 Architects purposely designed the building to reflect the Native American Culture of the region; the design resembled the Hopi pueblo at Oraibi Arizona. The architecture set a precedent for rustic design in Southwestern park structures. 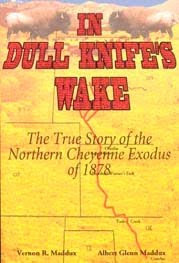 Important was the use of native materials and traditional motifs. 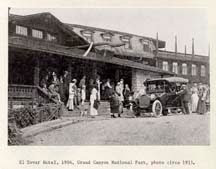 After Glacier became a national park in 1911, the Great Northern Pacific Railroad built Glacier Park Hotel, Lake MacDonald Hotel, Many Glaciers Hotel and nine mountain chalets. The rustic architectural design also carried over into the design of interiors. At Glacier Park Hotel architects designed a pit fireplace in the center of the lobby floor to create the ambiance of an outdoor campfire. 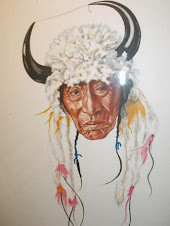 During the tourist season, a chief from the nearby Blackfoot Reservation entertained hotel guests around the indoor campfire with stories of Indian lore. In the 1920s, the American Association of Museums(AAM) believed that the increased numbers of people driving through national parks would benefit from roadside museums depicting the history and geology of the region. The AAM, in association with the Laura Spellman Rockefeller Memorial, asked Herbert Maier to design the first national park museum at Yosemite National Park. 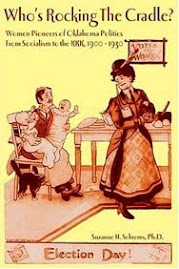 (Maier studied architecture at the University of California at Berkeley and at Heald’s College of Engineering in San Francisco.) In his plans for museums at Yosemite, Grand Canyon, and Yellowstone, Maier used native materials to make the buildings as non-intrusive as possible. Maier believed that park structures were “necessary evils—even the finest building is some what an intruder.” By using indigenous building materials in the right way, Maier sought to design buildings that appeared to be part of a rock outcropping or looked as though they were growing horizontally out of the ground. 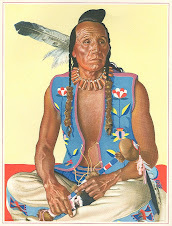 At Grand Canyon he maintained the Native American influence of the Southwest in his designs. At Yellowstone, Maier planned four museums that harmonized with the environment of each location. At the Madison Junction location, Maier designed the museum in the style of the popular 1920s bungalow, but enhanced the design with battered stonework, clipped gables, and low horizontal emphasis. 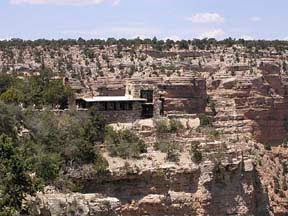 The building reflected the untamed aspects of the surrounding wilderness by its scale and roughness. Maier’s designs followed the precedent set by the first structure built in the Yellowstone, and continue to influence park structures into the twenty-first century.